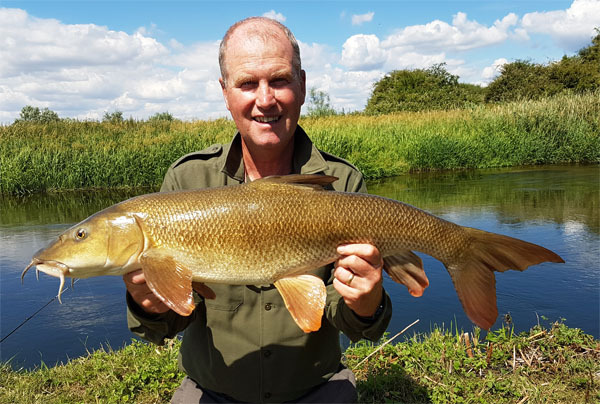 Still July and more chub and barbel. Having just managed to land that good looking chub last week of 6lbs 13oz it was back on the H.Avon for more adventures. Again I picked up Andy (you should have been here yesterday) Cowley. The day was to be hot and sunny, and boy oh boy so it turned out. The drive down saw us deciding where to fish. Andy wanted to try for a shoal of chub, in all about 14 of them. Me I wanted to wander around a little feed a few swims and see what turned up. We arrived at 7am and straight away Andy could see the chub in his swim and after introducing some pellets it didn’t take long for them to get their heads down. Well I walked and walked introducing pellets into a few area’s where I thought there would be barbel. I saw nothing until I returned to a swim close to Andy. There were a couple of chub and huge fish to be sure. Plus two barbel feeding on the hemp and pellet I had introduced. Time was moving on for me and at 11am I made my first cast into the swim. Andy had been frustrated by the chub in his swim and found hooking them next to impossible. 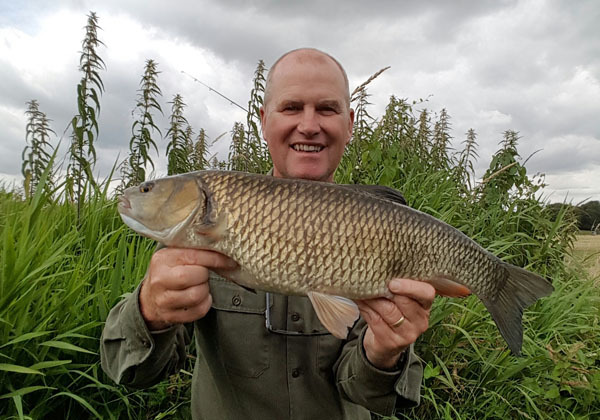 So after a few casts in the swim with the barbel the chub put in an appearance and a couple of sharp taps on the rod tip showed they were there. However the barbel were more cagey. They would sail into the swim from under the weed occasionally to pick up a mouthful however they were canny fish. The day wore on and Andy caught one chub on a size 16 hook and hair rigged pellet. Wow now that is difficult fishing for sure. The sun beat down and the wind was breathless. I had the umbrella up to protect me from the rays. Then John arrived to say hello and said this was the swim where he had seen a 13lb fish. We talked and nattered about fishy stuff. Whilst he was there the reel sang a song and a barbel was hooked. It didn’t look huge but it was a barbel for sure. It tried a few times to get under the weed bed where it would lay up. To be fair it wasn’t that large a fish and I had it under control easily. John netted for me and then and there we thought that it might be a double. However the scales read 9lbs 14oz. Never mind a beautiful barbel for sure. Well that was it for the day until late on after a move by Andy to a swim I had prebaited he too caught a small barbel of just under 8lbs so I was well pleased for him. 8pm came and we packed for the day for chips and a beer in Salisbury on the way home. My next visit was interesting to say the least. The river was low and clear. I baited the area where I had the 9lbs 14oz barbel but nothing and I mean nothing visited the area, so that was 3 hrs down the pan. I moved up to another swim where a few chub were seen feeding on the pellets I introduced. Then 3 large barbel came swimming up through the swim and passed by. However there were 4 smaller barbel in the swim that came out to feed occasionally from under the willow to feed. Plus bream and chub. Well I had a particularly difficult time catching one chub of 5lbs 3oz and pricking a barbel which spooked the rest. It was a nothing type of day however I enjoyed every minute of it. If you had a red letter day each visit then thing would soon become boring. However saying that I was looking forward to guiding on the river Wye during the next few days. First it would be Bill and son Dan, and then the following day James and Luke. I’ve guided these chaps before and knew I was going to have a wonderful time providing the barbel would play ball. This entry was posted on Thursday, August 4th, 2016 at 8:20 pm	and is filed under Uncategorized. You can follow any responses to this entry through the RSS 2.0 feed. Both comments and pings are currently closed.